RoboDoc: Should AI robots be developed for elderly care? An aging population combined with a shortage of skilled caregivers has resulted in the elderly facing the difficult situation of having to go into a care home or to live at home with inadequate support. In the past few years, Artificial Intelligence (AI) robots have become increasingly advanced and can now perform social interactions. As the technology evolves, these robots could provide assistance around the house, medical and emotional support and reminders to complete critical tasks such as taking pills. This article will discuss the benefits, drawbacks and potential dangers that AI robots could bring if they are developed for elderly care. A modern problem with a modern solution? The use of AI robots provides an opportunity to improve the quality of life of the elderly, at a critical time of a rapidly aging population and a lack of skilled caregivers. From a utilitarian point of view, implementing robots for elderly care is highly beneficial as it encourages the elderly to stay at home rather than to move into a care home. This is due to the elderly having the care they need in the comfort of their own home, facilitating independence and mental well-being. Kant would also argue that this is advantageous as it is an innate instinct to want to care for oneself. As a result, improving the care and quality of the life of others is perceived as morally valuable. The power of data is another important benefit of AI robot care. Robots that can collect vast amounts of data about their elderly patients can provide a higher quality of care and make complex decisions through advanced analytics. Data can also provide an improved and consistent service; it actively reduces human error and it can be personalised to the needs of the individual, significantly more so than call-out doctors or nurses that deal with many patients. It is also important to consider both sides of the human interaction; the care receiver and the caregiver. Elderly care patients can be suffering from complex and debilitating illnesses such as dementia, that cause the patient to not understand or accept their need for care. This relationship can result in significant distress to the caregiver. A utilitarian may therefore argue that replacing the caregiver with a robotic system would offer the greatest quality of life to the greatest number of people, as the caregivers could find work in more rewarding roles within the healthcare industry. Across the developed world it is considered a basic right to receive care when you are no longer self sufficient. A patient’s own values, their pride and their dignity, may lead them to consider themselves a burden on the caregiver or on society as a whole, regardless of this universal right. A robotic carer would not have the capacity to judge or to pity, and so would not cause the patient to feel as if they have lost their pride or dignity. In engineering a robotic solution to the problem, we would therefore grant the patient not only the care they are entitled to, but we would allow them to retain their core values, allowing the engineer to feel as if they have acted with virtue. Is this feeling of burden however more reflective on a problem in societies norms, one that does not have an engineering solution? Or are the old ways really the best ways? The robots themselves can be expensive, leading question to the availability of the technology on a wide scale. Consequently, the implementation of AI robots could be considered morally unacceptable from a utilitarian perspective, because it may only benefit a few people who can afford the technology. Robots store sensitive information which is vulnerable to hacking or misuse. Public safety, therefore, relies heavily on the virtue character of engineers to adhere to professional codes of conduct, which does not always occur. It could also be argued that the application of machine learning to enhance the quality of patient care acts against virtue ethics, as a model’s prediction is biased against the data it is fed, potentially leading to discriminatory or manipulative behaviour. Currently there is more emphasis on cobots – robots that assist alongside caregivers, however the technology has the potential to develop and entirely replace the jobs of the caregiver. Utilisation of AI robots could cause redundancies within the sector, and discourage future nurses from entering the profession, could it ultimately make the problem worse? The principle of care ethics comes from the motivation to care for those who are dependant and vulnerable, and is inspired by an individual’s memories of being cared for as well as an idealisation of self. In using a robot to provide this care, would it essentially be stripping the caregiver of this feeling, and the intrinsic quality caring for another brings to someone’s life? As the technology advances, care robots are becoming more humanoid, and providing not only physical, but emotional support. ChihiraAico is a Japanese robot designed to look like a 32-year-old woman, with the idea that people will be more comfortable talking to a robot about their problems if they look more human. Research has hypothesized the relationship between the human likeness of a robot and our emotional connection, as seen in Figure 1. It is difficult to find the right balance of human likeness that instills the desired emotional benefit from having a robot companion. 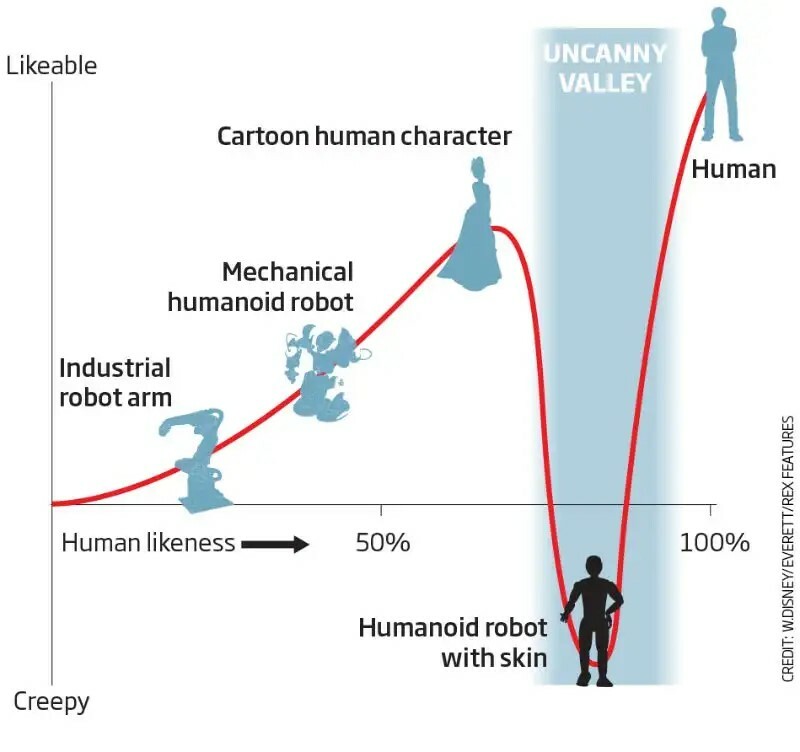 Too dissimilar and no emotional connection is made rendering it useless, too similar, the robot could fall in the “uncanny valley”. If the technology progressed further there comes an issue of deceit in making robots as familiar as humans, and whether that is ethical in itself. Are AI robots essentially being used as a way to rid people of the guilt and burden of caring for the elderly? Will they provide a realistic, much needed solution, or is it naive to think that a robot could ever replicate the care and attention of a human carer? Our initial decision, we are: For, developing AI robots for the care of the elderly. A very well written article! But I have to say, this is an area in which I’m very hesitant to fully embrace technology, and I personally still prefer the old ways. I understand that hand-in-hand with an ageing population comes a lack of care-workers, but must we really turn to technology to sort out a problem that I believe could be more easily and effectively fixed in other ways. I agree completely and hold my hands up to be part of the problem, that we might simply be turning to technology to make our lives easier and to rid ourselves of the responsibility to care properly for the elderly. Surely fixing issues in what is currently a very broken care system would be the more effective way of providing a solution. For example, improving pay and increasing job quality would encourage care-workers to stay in their jobs. I think it’s probably the lack of funding which lies at the heart of this social care crisis, and if left unchecked, introducing robotics into the care industry could turn out to be disastrous. On reflection, could our turning to anything other than actually caring properly for our elderly people, be a reflection of societies underlying laziness, dislike of genuine responsibility and a gradual abandonment of respect and common decency? I think its a nice idea that we could fix this problem in other ways, but it has been an issue for a while now and may even have escalated in its magnitude rather than improved. Is it naive to think that just because it would be the ‘better thing to do’ that it would happen, or do we simply not have the resources to provide that sort of care to the growing number of people and introducing some technology to help may be the best option we have. I think you are right that it could be a reflection on societies screwed up values, but society is ever changing and adapting, more people are living longer and maybe we need to adapt our approach to address this rather than trying to salvage old methods that are no longer practical or feasible. A good topic to debate. Currently, I’m against robots acting as carers for the elderly, although ‘cobots’ do have a role. As the world is not running out of humans and one of our functions is to develop society, the sole use of robots to care for many of our elderly could lead to the continuing feeling of isolation many of us feel. When you’re young, the idea of being cared for by a robot seems remote, but as you got older the idea that your final years would be spent without human contact could get depressing. These seems to me (and it’s worth stressing that it’s my personal opinion) to be a technology that will weaken society, working against utilitarianism. This is a complex issue which requires a balanced solution utilising many diverse approaches. I agree that one is development of AI robots but this is one tool to be used in conjunction with medical research, healthy lifestyle education/availability, social policy and conventional care work to provide higher standards for all at acceptable cost. I like this point, I think they do have the potential to serve as a useful ‘tool’ but they should just be that, as part of the bigger picture and combined with a multitude of other things. An interesting topic, personally i think that AI could be a useful aid for some of the less palatable tasks involved in care giving and pairing this with humans in certain roles that may need more emotion and support could in fact encourage people to work in this industry which is less desirable usually, AI could be used for rapid responsiveness at out of hours times for example, which could then triage and assess if a human was needed. A very interesting article and one that poses some serious questions that require answering before this technology is implemented. On a personal level, I would rather stick to our current methodologies of caring for the elderly as I believe AI would have huge negative social implications. I think your view reflects quite a common perception of AI technology as being frightening as its potential is quite unknown and people’s perception of their capabilities can become fairly escalated. I think it is important to figure out how to implement AI into society bit by bit, ensuring that it is still benefiting humanity at each step. Potentially co-bots are a very good step in the right direction to normalise peoples interaction with AI technology and to develop it’s capabilities in the most effective and ethical way. A well written and thought provoking article. From a personal perspective I believe that removing or minimising human social interaction would be detrimental to elderly people. However I think robots would have a part to play in undertaking routine or unpalatable tasks freeing up scarce human resource for building better relationships. Also robots might be of assistance in monitoring the person to provide useful data to medical professionals such as fluid intake, nutrition, taking of tablets, amount of sleep and exercise, where adverse data might flag an issue at an early stage enabling prompt intervention which is critical for elderly people. you may be right that you wouldn’t have to worry about your job over the next 10 years, but that isn’t to say that people entering the profession now or in a few years time will feel the same sense of security. I appreciate you’re view that if you could see the benefit of their help/assistance and they worked then you would be happy to work alongside them. With levels of loneliness so high in the elderly demographic do we risk isolating them entirely if we rely on robocare rather than human interaction. Even small daily conversations have been shown to improve the well-being of the elderly. The idea of robo care is that it will combat this sense of loneliness and isolation to some degree, providing interaction when there was none previously. It has been shown to improve people’s well-being after interacting with certain robo companions. I’m not sure I’d personally feel the same, but the facts say it works to some degree. This is a valid concept, it seems like it depends fundamentally on a balance of finance and existing resources. Human interaction trumps that of robotic but rather than use it as replacement care the optimal results could be from a combination. This is a really interesting topic that on the surface seems like a great idea but I think we are still a couple of decades away from it being realistic. I think the biggest barrier would be the cost to implement this. In the UK currently the NHS would not be able to fund this as part of health care provision so it would become something just for the elite. I think you made a particularly good point about allowing elderly people to live at home will give them more freedom and make them feel independent, as I feel this is a huge deal to people of that demographic. I believe this approach probably works best with idea of “cobots”. Full robot care may run the risk of a lack of interaction with other humans, a balance between independence and loneliness is important. One factor I feel really needs considering is elderly people’s hesitation to adapt to new technology, even if introducing benefits the most number of people, will they be happy with it? “Care” needs to be carefully defined and perhaps considered from two different aspects, physical and emotional. An AI robot that could perform assistance with household tasks would be an enormous benefit to many people, not only for the elderly. This would undoubtedly enable the elderly to remain in their own homes for an extended period of time, a great benefit to all concerned parties. Would this level of care develop into an emotional relationship between the elderly person and the AI robot? How emotionally dependent would the elderly person become on the robot, the carer… what would happen to this emotional bond when the robot broke… would it be like a death? The idea of AI robots being used as emotional support for the elderly is, in my mind, has a totally different set of ethical considerations. Who will decide which emotions are supported, will they support all elements of emotions, both love and hate? If they are involved in decision making, whose emotions and logic will they rely on? Will the AI “listen” to the elderly person and make decisions based on how they understand the user or simply on their own preprograming? The AI Robot cannot really “love” the elderly person, is it ethical to pretend it does? Would the AI robot remove all of the emotional labour that exists in a normal person to person relationship, could this then be detrimental to the traditional person to person relationships? In conclusion, I think an AI robot who cared for the physical needs of the elderly, detecting and removing dirt, cooking and cleaning, not emotionally involved would be ideal. Emotional care and support should be left to human beings. I think the key is in the word “care”, the definition of which must include some deep human emotion on the part of the care giver, particularly as the people needing care are likely to be vulnerable. A robot is never going to achieve this. By all means develop AI to perform routine tasks such as home cleaning, medication reminders/dispensing, assistance with cooking and dressing. Include speech to make the robot feel less like a machine but never leave actual human contact out of the situation. It is only humans who will ever be able to truly provide empathy. Sometimes the elderly just want to be listened to: can we truly programme robots to listen and make appropriate responses without trying to provide “logical” conversation? Develop “an electronic home assistant” to do the chores ( and, please, not a creepy human look-a-like) but keep plenty of actual human contact in care provision.